“Both of them are swinging the bat very well, seeing the baseball very well,” manager Jeff Banister said, adding that Odor has been patient at the plate and Gallo has been aggressive in the zone. “Getting some pitches to drive, and when he does, he drives them out of the ballpark,” Banister said. “Joey’s been really good at the plate, too, been really focused,” said Odor, who went deep in the eighth with a towering 445-foot solo shot beyond the Rangers bullpen in right-center for his 13th homer. Bundy struck out six and walked two in his six innings. He has allowed 27 homers this season, one more than Kansas City’s Jakob Junis for the most in the majors. Orioles DH Mark Trumbo’s RBI single in the seventh was his 1,000th career hit . He is the 31st active player with at least 1,000 hits and 200 homers (214). … Texas SS Elvis Andrus extended the longest active hitting streak in the majors to 15 games with his double in the first. … Texas has won seven of eight overall. Vladimir Guerrero, whose only season with the Rangers was for their first World Series in 2010, was honored in a pregame ceremony after his induction last weekend into the Baseball Hall of Fame. Guerrero threw the ceremonial first pitch to Ivan “Pudge” Rodriguez, the former Rangers catcher inducted into the Hall of Fame last year. Rangers: CF Delino DeShields is on MLB’s seven-day concussion disabled list. The Rangers announced the move Saturday, more than three weeks after DeShields banged the back of his head when trying to make a sliding catch in Boston. He had been scratched from Friday’s lineup because of headaches. Right-hander Drew Hutchison will start the series finale for the Rangers a day after agreeing to a major league contract. 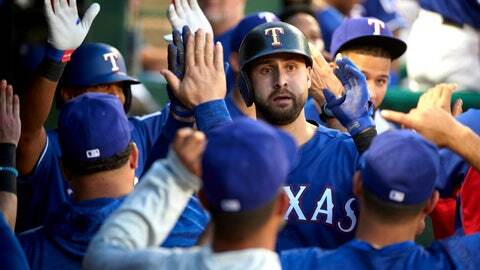 The Rangers announced his signing in the eighth inning of Saturday night’s game. It will be his first big league start since 2016 with Pittsburgh. He began this season in the Phillies bullpen but was designated for assignment May 31. He rejected an outright assignment, signed a minor league deal with the Dodgers and was with Triple-A Oklahoma City before requesting and being granted his release last Tuesday.